Due to the Independence day in the US there is no important report to affect USDCAD but Canada is releasing Manufacturing PMI. USDCAD started today with bearish bias and it seems that today it is going to continue its decline within the descendant channel. 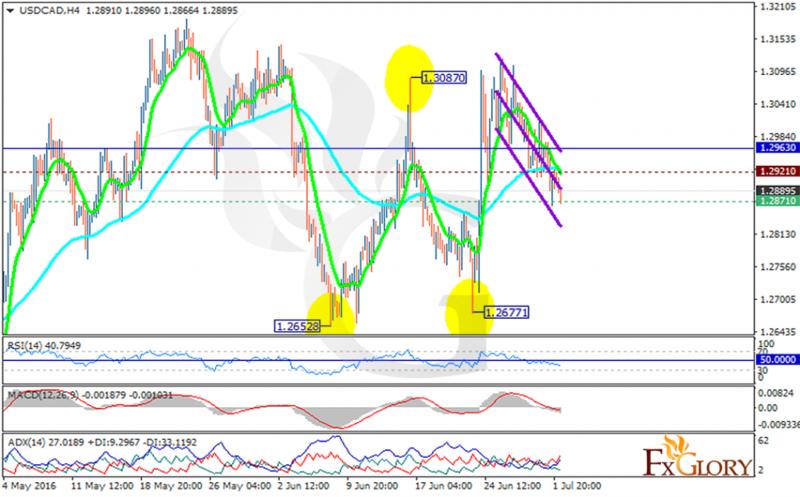 The support rests at 1.28710 with resistance at 1.29210 which both lines are below the weekly pivot point at 1.29630. The EMA of 10 is staying at the same spot with the EMA of 75. The RSI is below the 50 level, the MACD indicator is in negative territory and the ADX is showing strong sellers. Short positions are recommended with the target at 1.2788.